Anticoagulant drugs (also known as blood thinners) are chemical substances that prevent or reduce coagulation of blood and prolong the blood clotting time. These drugs are majorly used for high risk of blood clots in various medical conditions, such as atrial fibrillation, deep vein thrombosis, myocardial infarction, pulmonary embolism, stroke, and others. 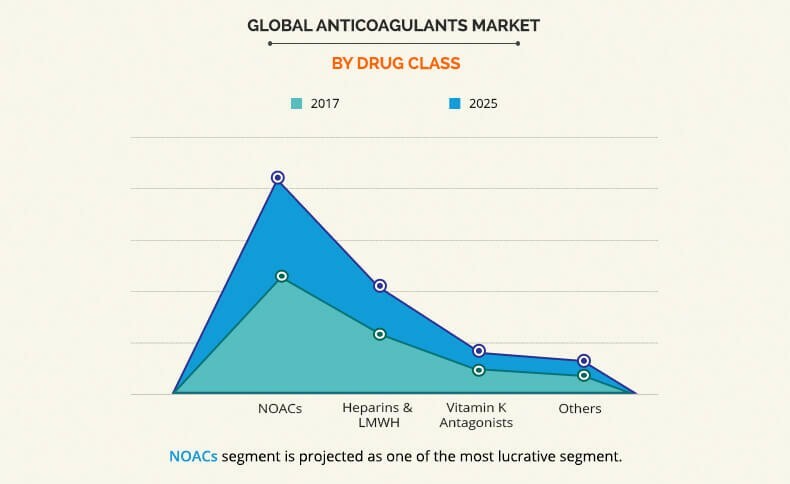 The global anticoagulants industry is anticipated to show significant growth during the forecast period, owing to increasing prevalence of venous thromboembolism (VTE) and cardiovascular disorders, growing adoption of novel oral anticoagulants (NOACs), and rising awareness of NOACs in the developing region. Furthermore, increase in number of obese and elderly people, higher unmet needs, and surge in demand of novel therapeutics further support the market growth. However, higher price of NOACs and lack of antidots for NOACs impede the market growth. The global anticoagulants market is segmented based on drug class, route of administration, application, and region. On the basis of drug class, the anticoagulants market is classified as NOACs, heparin and LMWH, vitamin K antagonist, and others. By route of administration, the market is segmented as oral anticoagulant and injectable anticoagulant. The various application markets are atrial fibrillation & heart attack, stroke, deep vein thrombosis (DVT), pulmonary embolism (PE), and others. Region-wise, the market is studied across North America (U.S., Canada, and Mexico), Europe (Germany, France, UK, Italy, Spain, and rest of Europe), Asia-Pacific (China, Japan, Australia, India, South Korea, and rest of Asia-Pacific), and LAMEA (Brazil, South Africa, Saudi Arabia, and rest of LAMEA). Presently, the NOACs segment is a major revenue-generating segment in the anticoagulants market and is anticipated to show dominance during the forecast period, owing to growing adoption of NOACs in developing countries and rising use of NOACs over the warfarin. Presently, NOACs drugs, such as rivaroxaban, betrixaban, apixaban, edoxaban, and dabigatran, are available in the market. Furthermore, NOACs offer various advantages over the warfarin, such as rapid onset action, lesser interaction with drugs and food, predictable pharmacokinetic action, shorter half-life, and no dietary restriction. These have been further supporting the market growth. On the other side, lack of antidote for NOACs and higher price impede the anticoagulants industry growth. Presently, the atrial fibrillation & heart attack segment is a major revenue contributor and is anticipated to show dominance throughout the forecast period, owing to large target population and increased use of anticoagulants in treatment of these conditions. However, DVT is expected to witness fastest market growth, owing to increased prevalence of DVT and technological advancement in diagnosis of DVT. The Asia-Pacific region represents lucrative opportunities for players operating in the anticoagulants market, attributable to its increasing population base, rising prevalence of cardiovascular disease and VTE, developing economies, improving diagnosis rate, and growing demand for ideal therapeutics. Furthermore, continuous economic development with developing healthcare infrastructure and improving healthcare awareness have been further supporting the market growth. However, treatment expenses for anticoagulant drugs are anticipated to hamper the market growth in Asia-Pacific. 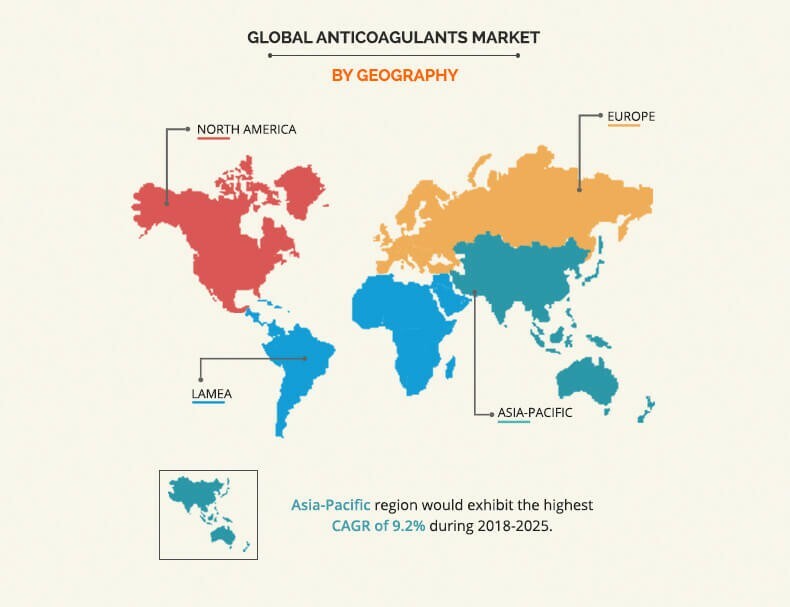 The key players profiled in this report of anticoagulants market include Aspen Holdings, Bayer AG, Boehringer Ingelheim GmbH, Bristol-Myers Squibb Company, Daiichi Sankyo Company, Limited, GlaxoSmithKline plc., Johnson & Johnson (Janssen Pharmaceuticals, Inc.), Pfizer, Inc., Portola Pharmaceuticals, Inc., and Sanofi S.A. 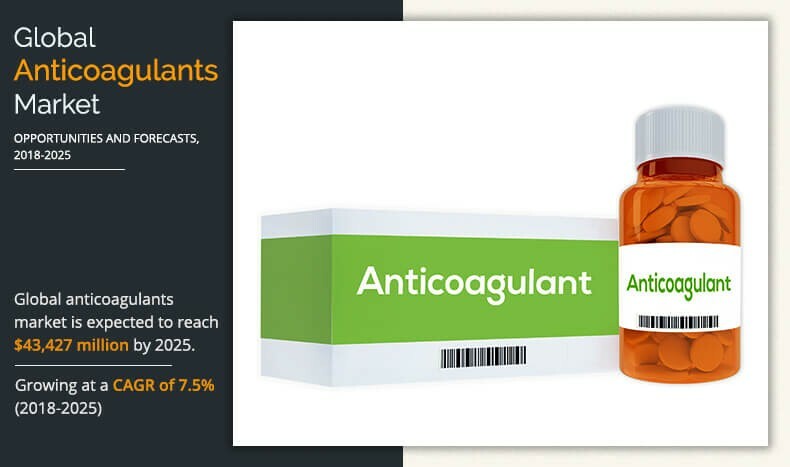 The study provides an in-depth analysis of the anticoagulants market size along with the current trends and future estimations to elucidate the imminent investment pockets. 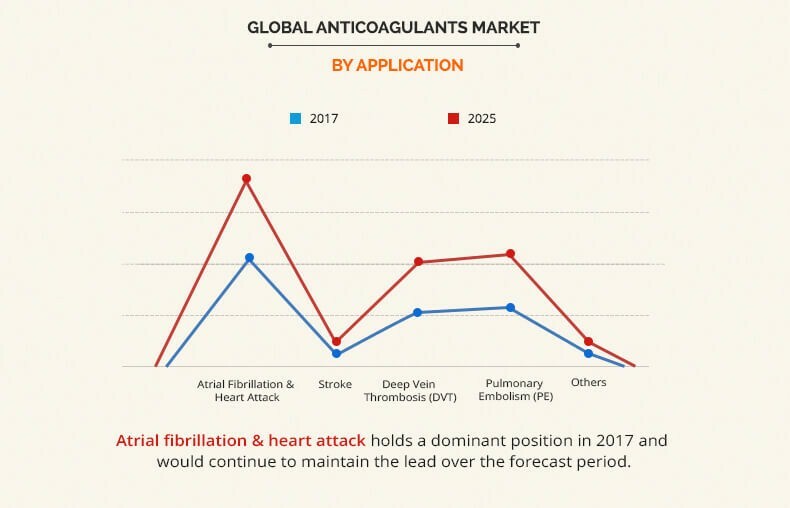 It offers a quantitative analysis from 2017 to 2025, which is expected to enable the stakeholders to capitalize on the predominant anticoagulants market opportunities. The profiles and growth strategies of the key players are thoroughly analyzed to understand the competitive outlook of the global anticoagulants market. 8.5. Daiichi Sankyo Co., Ltd.
Anticoagulants (or blood thinners) are chemical substances that prevent or reduce coagulation of blood and prolong the clotting time. The adoption of anticoagulants is expected to increase during the forecast period, owing to increase in the target patient population across the world and the growth in demand of novel oral anticoagulants (NOACs) among the developing countries. Increase in prevalence of venous thromboembolism (VTE) and cardiovascular disease and rise in demand of novel therapeutics drive the market growth of the global anticoagulants market. In addition, technological advancement in diagnostic devices and higher number of unmet needs along with growing demand for NOACs in developing countries are projected to supplement the market growth during the forecast period. Furthermore, increasing geriatric population and rising prevalence of obesity have been further supporting the market growth. However, very high price of NOACs and lack of antidote for NOACs hinder the market growth. North America is expected to remain dominant during the forecast period, owing to increase in the target population, early diagnosis, presence of a large number of trained medical professionals, and higher demand for novel therapeutics. In addition, Asia-Pacific and LAMEA are expected to offer lucrative opportunities to the key players during the forecast period, owing to its developing healthcare infrastructure with a growing number of target population.